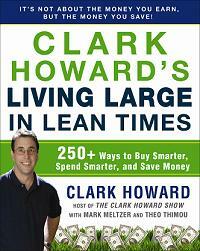 This week’s book review is for Living Large in Lean Times from Clark Howard. After receiving a review copy I went ahead and read the book over the last few days. There’s a ton of information, so I finished it fairly quickly. I’ll highlight some points to help you decide if this is a great book for you. As you can see, Clark organizes his book according by different areas of spending. I found it perfect as a reference for those that may have a particular area in their finances that they’d like to tackle. You may want to focus on your insurance or maybe you’re looking at booking a vacation. you don’t have to read through the entire book to find what you need, you can just pick it up at that chapter. While each section has some valuable tips on saving money, I was especially drawn to some areas that directly applied to us. In regards to finding and buying our next car, Howard offers some great tips on buying used without getting a lemon. He shows readers how to check car repair records, examine total operating costs, and how to find a hybrid that will itself back quicker. He also tackles selling your old car in a separate transaction, not trading it in at the dealership. For those interested in financing their next car, Howard has tips on getting the best deal and avoiding getting gouged at the car dealership. Having to paid for cars means that our biggest auto expenses come from car repairs. Howard has tips on getting reimbursements by checking recall and service bulletins, finding a second opinion for your repairs, and when you really need oil changes. These tactics may seem minor, but over the life of the cars, it can save some significant amount of money. I think we do a generally good job with our day to day finances, however, I really believe my husband and I could improve our insurance policies to reflect our current situation and save some money in the process. Inertia is one factor against us, so I was happy to see Howard offered tips in this area. I was especially interested in learning more about Flexible Spending Accounts (FSA) and how we can use our pretax dollars and save money. He also reminded me that we needed to document our belongings either with video or a site like knowyourstuff.org. He also has a guide to getting a free C.L.U.E. report to make sure insurance companies have accurate information on you and your spouse. I think this book is a great fit for people looking at being savvy with their finances. There’s a ton of information that you can dig through to make sure your money is going further for you. While some of Howard’s tips may seem a bit extreme, they are frugal tips that can cut your spending greatly. I wouldn’t dismiss them too quickly – talk it over and try it if possible. I think we handle our finances pretty well, but we could do a better job. I’ll be using this book to optimize our spending and savings. Over the rest of the year, I share the results to see if we can improve our finances. It may help us reach our financial goals for this year sooner.